Front row, from left to right: Damir Vodenicarevic, Laurie Calvet, Damien Queiloz, Sylvain Eimer. 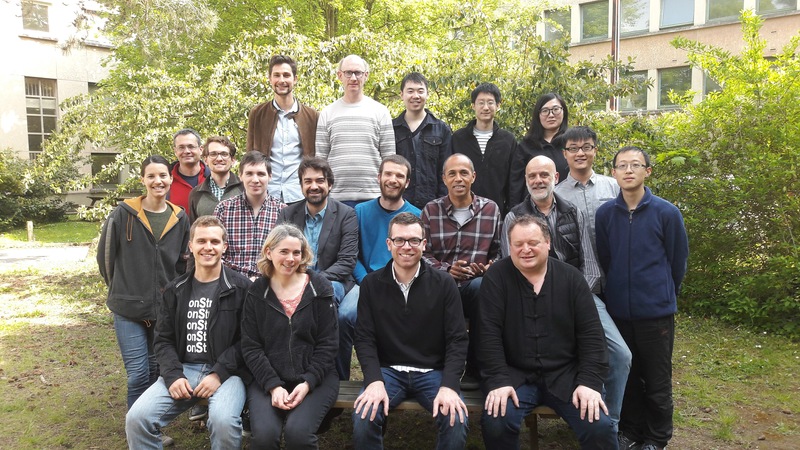 Second row: Liza Herrera Diez, Jacques-Olivier Klein, Christopher Bennet, Sébastien Chevaleyre, Nicolas Locatelli, Adrien Vincent, Dafiné Ravelosona, Giancarlo Faini, Gefei Wang, Boyu Zhang. Back Row: Tifenn Hirtzlin, Nicolas Vernier, Yuting Liu, Yu Zhang, Qi An. Damien Querlioz, CNRS researcher, group leader. Dafiné Ravelosona, CNRS research director. Giancarlo Faini, CNRS research director. Liza Herrera Diez, CNRS researcher. Jacques-Olivier Klein, lecturer at Université Paris Sud. Nicolas Vernier, lecturer at Université Paris Sud. Alice Mizrahi, PhD student. Now at National Institute of Standards and Technology. Joseph S. Friedman, Postdoc fellow. Now at The University of Texas at Dallas. Xueying Zhang, PhD student. Now at Beihang University, China. Weisheng Zhao, CNRS researcher. Now at Beihang University, China. Prof. Sandip Tiwari, Cornell University, USA. July 2014, June/July 2015, June/July 2016. Prof. Massimiliano Di Ventra, University of California, San Diego, USA. March 2015. Sohini Manna (PhD student), University of California San Diego. October 2015 to April 2016. Julien Martel, ETH Zürich. July 2015. Selina La Barbera, IEMN Lille. March 2015.